Based in Frederick, Maryland, the Markey Brothers and their team create custom metal signage and decor using a unique 3D process to make high-quality pieces of art that will captivate audiences. 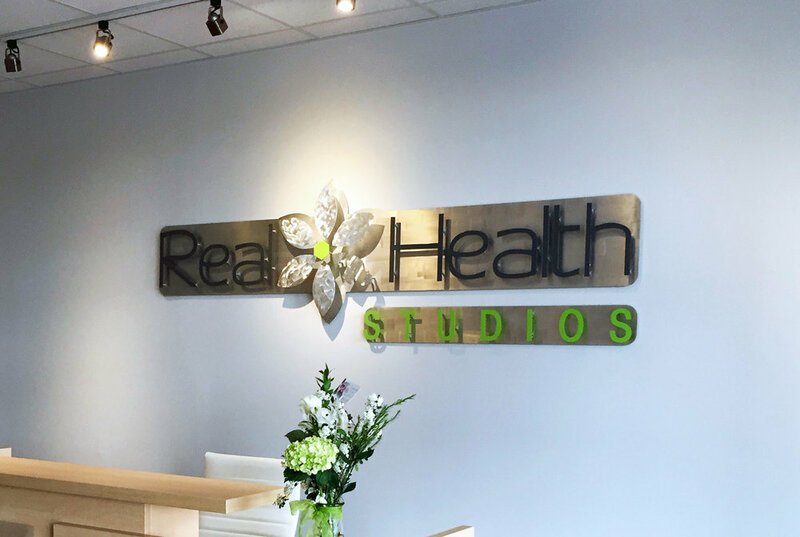 Our custom commercial signage is made with superior craftsmanship, enabling us to stand out from the competition and fabricate signs that last a lifetime. Commercial clients locally and nationwide come to us time and again for the quality of our signs and our attention to detail. Are you a small business? No problem. We are able to match the style that many small businesses want to achieve for their space. With a completely custom process and an incredible range of colors of finishes, ShieldCo can provide the unique, artful sign you are looking for. Special custom art and decoration pieces take time and care to develop. With each custom commission, we take the time to understand your specific design needs. Thanks to 2D and 3D modeling technology, we are able to confirm all of the individual aspects of your design prior to fabrication. Looking for a little something extra? Our internal and external custom lighting options add exceptional visual impact to any sign. 1) Longevity - The LEDs we use on our custom metal signs are rated for 40,000 hours and with normal use would last more than 10 years! 2) Customization Options - Each sign comes with a remote control which allows you to turn the sign on and off, change the color of the lights, dim the lights, or have the lights cycle through the various colors with one of the preset modes on the laser cut aluminum signs. 3) Efficiency - A normal illuminated metal sign will use about as much electricity as a 60 watt light bulb. Other lighting options can use 5X as much electricity! 4) Safety - LEDs are powered with 12 volts and that reduces the heat that is produced by each LED bulb. Depending on the situation, external lighting can be the right option. With external lighting you can highlight parts of your logo a little bit differently. This is particularly popular for individually mounted signs, or walls that don’t have an outlet nearby. Or maybe it isn’t a sign that you want at all, but something unique and beautiful - like this Maryland blue crab for a local seafood distributor. Work directly with a skilled designer to bring your design to life as a custom metal piece of art. We create 3D mockups for every sign before it goes to production so you are certain of exactly what the final product will look like. We aren’t a sign company, but we make art that organizations use as signs. Our unique process will help you stand out from the crowd. We ship nationwide - no matter where you are, you can get the perfect product. A portion of our proceeds benefit the Army Ranger Led 501(c)3 organization The Pointe Du Hoc Foundation that helps US Army Rangers and their families. We focus on metals and we can use any of these metals : aluminum (our company-wide favorite), steel, stainless steel, brass, copper, and coreten. 1) Durability - Aluminum is strong, that’s why they make truck frames out of it, plus it doesn’t corrode which means it will remain strong season after season in the elements. 2) Weight - Aluminum weighs 1/3rd the weight of steel, so a 6ft wide by 2ft tall sign, in multiple layers, will weigh about 30 lbs. Light enough to hang on any wall. 3) Cost - Aluminum per square inch about 25% the cost of stainless steel. If you decide to choose a material such as coreten, stainless steel, or copper, likely the luster of the natural material will be the color. However, with aluminum, we can paint (powder coat) it any color you want. We have thousands of colors to choose from and can custom make colors if need be. Through the 1000s of signs that we’ve created, we’ve identified five main categories that most signs fall under. This option leaves a void where the lettering or logo would be, exposing the wall behind the sign. We can use our typical french cleat on the back of the sign for easy installation, or we can use stainless steel standoffs if required. If we add a framework to the back of the sign, we can also add custom lighting. This is similar to Option #1, but with a back panel attached behind the negative cut-out panel. This adds depth and visual interest to the sign, and is the first true step into the "3D" realm. The first layer casts shadows on the second. As with all our signs, custom lighting is available for this sign. This sign features your logo and/or lettering, cut out separately and raised from the surface of a back panel with spacers, to give your logo depth and texture. This type of sign is our specialty and what separates us from other signage companies. Our attention to detail is paramount - we take the time to analyze your logo or design and understand how to transform it into a piece of art that brings the design to life. We are able to produce these signs to an extremely high standard due to our specialist machinery and detailed process. Our customers love these signs because every part of the sign is attached to the backer, which makes the sign extremely easy to hang. Installation can take as little as 10 minutes. As with every sign, custom lighting is available to suit your needs. For this type of sign, we custom cut your logo into individual pieces that have threaded studs extending from the back of each piece. We provide you with a template to mount on your wall, that guides you where you need to drill each individual hole. Once the holes are drilled, you can install your sign with a foolproof method that ensures your logo looks excellent on your wall. This option is very popular when the wall color or texture is something you want to showcase in addition to the sign. Our individually cut letters look professional on your wall, and your logo adds a compelling artistic complement, made in our signature 3D multilayered style. The lettering (or parts) would be individually mounted on the wall, with threaded studs and spacers that extend from the back of each part. The custom-made logo element would have a french cleat mounted on the back for easy hanging. For the installation process, we provide you with a template to mount on your wall that guides you where to drill each individual hole. From there, you can install your sign with a foolproof method, ensuring that your logo looks excellent on your wall. You have an idea in your head, but how can you be sure what is in your head is going to be what we make for you? What is the sign going to cost and how long is it going to take? What about installation? Check out the following process that we use for every sign to help you understand our process that has earned us all 5 star reviews. You can provide as many or as few details as you want. The more information you are able to provide, the less information we will have to collect from you later and we will be able to provide you with a more accurate quote. The most important items to provide in your inquiry, after your contact information, are an image of your logo, an image of where the sign is to go, the expected size you'd like, and whether you'd like lighting or not. If you have provided a logo, we will give our best shot at quoting your project. However, before we officially quote the project we would love to have a conversation with you on the phone to talk about the specifics of the project. We've learned that in almost every situation, there are particular requirements that are best uncovered through an informal conversation with one of our sales members. We quote in wide ranges to allow us to modify the sign and continue to hone in on the exact price after our conversations. We can make your custom metal sign in many number of ways. If you are unable to talk on the phone, we can certainly work with you via email, but we prefer to make the individual connection with each of our clients. If the price we quote is within your budget, and you are interested in moving forward, we will make you a 2D mockup to show you how the sign is going to look. If after the 2D mockup you are still interested, we would be glad to make you a 3D mockup for just $1. There isn't any commitment on your part to purchase the sign after the 3D mockup. The 3D mockup is extremely important for the entire process of making the sign as it is a clear example of how we are going to make the sign and you can be sure that your sign is going to look exactly like the mockup. In the 2D mockup we can easily show dimensions and the layout and colors of the sign. In the 3D mokups, we want to focus your attention on the depth of the sign and the shadows that the parts cast on each other. Click on the right hand side of the photo to see different angles of the sign. We will send you a link to your specific project and you can review all of the details of your sign. This description and the 3D mockups are what we are agreeing to provide for you. You can make the deposit payment for the sign at this link. Once the sign is complete, all the parts are assembled and straight and the lighting is checked we take final pictures of the sign so you can see how it looks. We will direct you back to the same link we sent previously for the deposit payment so you can make the final payment. 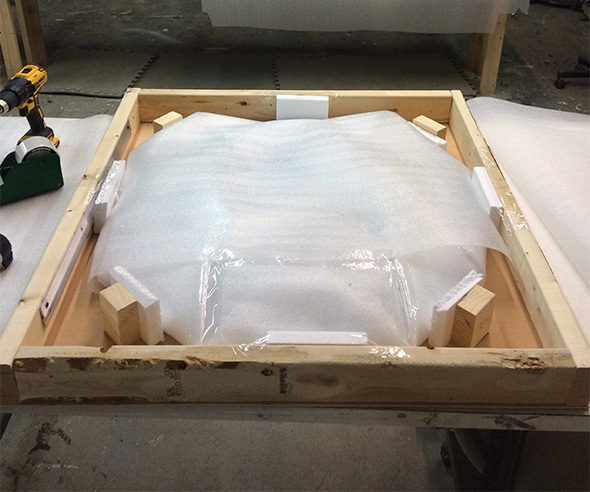 Once we have received the final payment we will painstakingly pack your sign for shipment. We’ve perfected the packing of our signs an in the thousands of signs that we have shipped we have a 100% successful delivery rate. We build our boxes our of 2x4s and plywood and pack each part with multiple layers of foam so the sign will look pristine when you receive it.